It can be heartbreaking to watch helplessly as long-awaited orchid buds brown, die and drop instead of becoming those much-anticipated flowers. Bud blast, when buds wither and fall from an otherwise healthy plant, may occur through any of a number of causes. Buds are the most sensitive part of an orchid, and are easily affected by unsuitable conditions in the growing environment. Cattleyas, Phalaenopsis and Dendrobiums seem particularly susceptible to this problem. The most frequent reasons for this are as follows. Orchid flowers can abort for a variety of reasons, but the end result is always the same. Fortunately, precautions can be taken. Under- or overwatering is a common cause of bud blast. If a plant becomes too dry, it may withdraw moisture from buds as a survival mechanism. Overwatering can damage the orchid’s root system, with the end result being a lack of water to the plant. As with underwatering, when the plant is unable to absorb sufficient quantities of water, it will withdraw water from the buds, bringing about their demise. Budding Cattleyas are particularly sensitive to overwatering, which can cause buds to blacken and die while still in their sheath. Water that is allowed to sit on buds or in bud sheaths provides the perfect environment for fungi and bacterial growth, generating rots that will blast buds. Watering with cold water can shock a plant, causing bud drop. Temperature extremes or rapid temperature changes are often a culprit in bud blast. If a budding orchid receives drafts from a window, an air conditioning or heating vent, or even a rush of air from a hot oven, it may drop buds. Similarly, buds may blast when exposed to temperature fluctuations that occur when taking a plant in from the car or outside during hot or cold weather, bringing plants back into a heated house after a summer outdoors, or temperature extremes caused by running heating or air conditioning for only part of the day. Orchid buds are sensitive to fumes from paint, natural gas leaks and other chemicals. Once pollinated, flowers generate methane gas, causing them to collapse and saving energy for seed production. Methane or ethylene gas from other sources may also trigger bud or flower collapse. Ethylene gas given off by ripening fruit; gas leaks; inefficient burning of gas stoves or heaters; engine exhaust; cigarette, cigar or pipe smoke; open fires; smog or air pollution can also cause bud blast and age and distort open flowers. 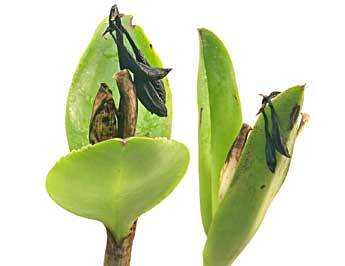 If lighting available to its developing buds is inadequate, an orchid won’t flower properly. Low lighting can cause buds to abort. Too much lighting may also cause trouble; direct sunlight on developing buds can overheat and desiccate them, leading to bud blast. Fertilizer, fungicide or pesticide applied at dosages above a plant’s tolerance or in a manner inconsistent with manufacturer’s instructions may damage buds, causing them to drop. Developing buds need high humidity. If their environment is too dry, or the ambient humidity fluctuates a great deal, buds may be adversely affected and drop. Aphids and thrips can cause bud blast. These insects feed on flowers and flower buds, sucking the plant juices. The buds of infested plants fail to develop properly, dropping from the plant or opening to damaged and disfigured flowers. Thrips can be controlled using Diazinon or Malathion. Aphid control often involves not only eliminating the aphids themselves, but also the ants that farm them. Insecticidal sprays and sugar-based ant baits are recommended. For a few aphids, dab with a cotton swab soaked in rubbing alcohol. Other means of control include insecticidal soaps, horticultural oils (Neem or Sunspray), growth regulators and chitin inhibitors (Enstar II), Pyrethrum-based insecticidal sprays, stronger insecticides (Malathion), and systemic insecticides (Orthene, Shield). Repeat any treatment method twice after the initial application at seven- to 10-day intervals to kill successive generations. Test new controls on a small population of plants before widespread use. When using insecticides, check labels to be certain the insecticide works against the particular pest and that it is approved for use on orchids. Always use any chemical in strict accordance with manufacturer’s instructions. Occasionally, even under perfect cultural conditions, an orchid will continually abort buds. There may be a genetic mutation responsible for its inability to produce viable blooms, in which case the plant should be discarded. Bud Blast. 2002. Helpfuls and Tips. Hamon, Avas B., PhD. 2002. Orchid Pests. In: Orchid Pests and Diseases. American Orchid Society, Delray Beach. judywhite. 1996. Taylor’s Guide to Orchids. Houghton Mifflin Company, New York. White, Phillip Z. Questions from Users Answered, Orchid Pages.